Battle Baptists are through to the semi-finals of the National Christian Cup after defeating higher division opponents at the Rec on Saturday. Goals from Dean Boyd, Trystan Mayhew, Glen Carrick and Harry Loates sealed a 4-1 victory against Milton Keynes-based Cleanslate, who play a step above Battle in the football pyramid. Dean Boyd taps in to open the scoring at Battle Rec on Saturday. The quality of the Baptists’ opponents was clear from the start as they demonstrated strength and technical ability to put Battle under pressure for the first 10 minutes, despite not creating a clear chance. On the other hand, the Baptists’ first attack of quality resulted in the opener. Mayhew ran off the Cleanslate full-back, who he troubled all afternoon, having been superbly picked out by Mark Dowling, and stung the goalkeeper’s palms with an angled drive before Boyd tucked in the rebound. Cleanslate looked dangerous and were seeing plenty of the ball in the Battle half, but the midfield unit of Mayhew, Carrick, Dale Vinall and Loates was tenacious and organised, and the back four of Ian Rafati, Ollie Jeffs, Tom Saunders and Dowling, rock solid in dealing with any threats that made it through; a rare scare coming when Cleanslate’s forward headed over from a set-piece. The second Battle goal capped off a superb team move. Vinall and Carrick battled to regain possession, then Dowling’s precise ball found Adam Higgins-Gooch’s intelligent run in the channel. The striker dropped his shoulder to beat his marker and delivered a driven cross from the byeline which was met at full stretch by Mayhew at the far post, with the ball crashing in off the underside of the bar. Harry Loates on the ball for Battle Baptists during their 4-1 victory. Cleanslate were quick to respond and two crucial interventions from Saunders prevented likely goals. Kicking with the strong breeze, the Baptists sensed they needed a third before half time. Boyd fired wide on the counter-attack, Saunders put a header just the wrong side of the post and a terrific defensive header denied Carrick from a corner. The very next set-piece did see Battle open up a three-goal cushion; Boyd delivering to where Carrick and Saunders were queuing up to score; it was Carrick who nipped in to head home. Playing into the breeze in the second period, the Baptists were content to hold their shape and defend stoutly; but the situation got even better for them when Boyd hit a gorgeous crossfield ball for Loates, who took advantage of the full-back’s hesitancy on the heavy pitch, to drive into the box and finish past the goalkeeper. Dean Boyd weighs up his options as Battle go on the attack. 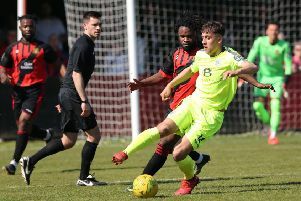 Cleanslate opted to go for broke to wrestle back the four-goal deficit by throwing men forward, showing great skill and pace to test defenders, but Battle held firm and might have scored on the counter-attack through Boyd and substitute Finlay Garlick. Scott Vickers and Mike Amar made timely contributions as they came on to lend their energy to the Baptists’ defensive effort, but Jake Rudwick in the Battle goal was rarely troubled until he was finally beaten by an excellent 25-yard strike into the bottom corner with a few minutes left. The Baptists will face south east London side Christ Central in a home semi-final on Saturday April 1, but first they will return to Macron East Sussex Football League Premier Division action away to Rock-a-Nore next Saturday.